In a business where “location, location, location” often means a strip mall, industrial park or an overtly anonymous storefront, Dr. Green Meds has its competitors beat. Sitting on the ground floor of a recently refurbished two-story office building in the prosperous Los Angeles suburb of Valley Village, its neighbors are Web designers, talent agents and an upscale hair salon. None appear to object to Dr. Green Meds’ conspicuous sign on the sidewalk outside, or that its hours are posted on the building’s front door. The dispensary is right across the street from a Gelson’s, an upscale Southern California supermarket chain, and a Starbucks. In an amusing coincidence, the Four N 20 restaurant is right next door. The 101 Freeway – the nation’s busiest highway – is just a block away. “We wanted to create an upscale feeling, and our location has helped us achieve that. We like where we are.” said Gene, Dr. Green Meds’ soft-spoken but genial 37-year-old manager, who emigrated from the former Soviet Union when he was a child (he declined to use his last name). Iron gates front its reception area but they are decorated with maple leafs. Signed artwork adorns the walls. Medication jars, pipes and lighters are displayed behind wood and glass counters, spaced precisely enough to suggest a ruler was involved. A far more elaborate lit glass cabinet displays bongs. A Dr. Green Meds employee wiped down the already spotless surfaces with glass cleaner and paper towels. 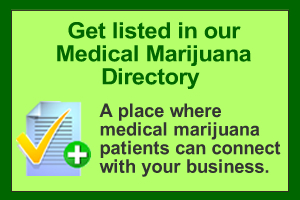 Dr. Green Meds offers about 15 different types of marijuana – indicas, sativas and hybrids. Like a lot of dispensaries, it has had to cut prices to remain competitive. It sells a medication called White Rhino for as low as $10 a gram. Joints called Jays are sold for $6 apiece, or three for $15. Their contents are culled from remnants at the bottom of the display jars. The most expensive item, Chocolate Og, sells for just $115 for a quarter of an ounce. “Prices, and customer service, are going to determine how well we do,” said Gene, who markets the dispensary through ads in Kush Magazine and on a website called weedtracker.com. Dr. Green Meds is also one of the very few local dispensaries that does not carry edible marijuana products. Gene feared product liability issues by selling foodstuffs that could not be completely certified as safe. The dispensary does carry Lollipipes, a lollipop-like product from a Berkeley firm that can be used for smoking and may be consumed whole. Gene said sales have been growing steadily, but there have been setbacks. Dr. Green Meds closed for two months near the end of last year because the refurbishing of the office building was interfering with patient traffic. And there is the possibility that the City of Los Angeles could shut the dispensary down as part of recently enacted regulations. This seemed to be foreshadowed by what was broadcast on the dispensary television during a recent afternoon: “The Interrogators,” a reality television show about police detectives. Yet Gene said he has yet to be contacted by the city about closing. Indeed, he has only been contacted by law enforcement once – the Los Angeles County Sheriff’s Department asked if he would volunteer for a youth program. In the meantime, Dr. Green Meds was active in obtaining signatures for the statewide ballot proposition that may completely legalize marijuana is passed by voters in November. Buy:Prevacid.100% Pure Okinawan Coral Calcium.Zovirax.Petcam (Metacam) Oral Suspension.Actos.Zyban.Synthroid.Accutane.Valtrex.Prednisolone.Retin-A.Human Growth Hormone.Lumigan.Arimidex.Mega Hoodia.Nexium…. Buy:Synthroid.Accutane.Actos.Nexium.Valtrex.Petcam (Metacam) Oral Suspension.Mega Hoodia.Arimidex.Retin-A.Prevacid.Zyban.Zovirax.100% Pure Okinawan Coral Calcium.Human Growth Hormone.Prednisolone.Lumigan….